If all goes to plan, the city's next big opening will take place Friday with the debut of Wexler's in the Financial District. To quickly recap, Wexler's is situated in the historic Les Amis building and is the upcoming "New American BBQ" restaurant headed by exec chef Charlie Kleinman (resyline now open). 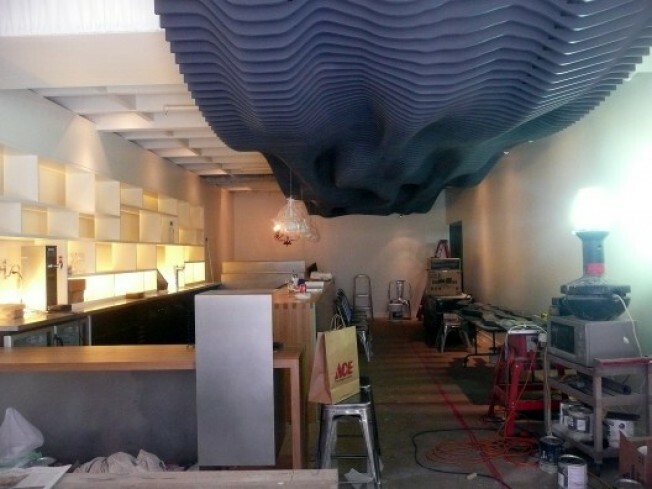 Also, we're thinking that the Aidlin Darling (also of Bar Bambino) interior will create some buzz too. As you can see, though not yet finished, it's a slick design, one definitely highlighted by the big laser-cut, undulating ceiling installation, or as we've affectionately nicknamed it, Smokey.